Meet Karen, Sebastian & Oakley. Karen Eccleston, wife of Scott Eccleston who co-owns Stryker Electrical Contracting and Stryker Electric & Air, has two very special dogs named Sebastian and Oakley. 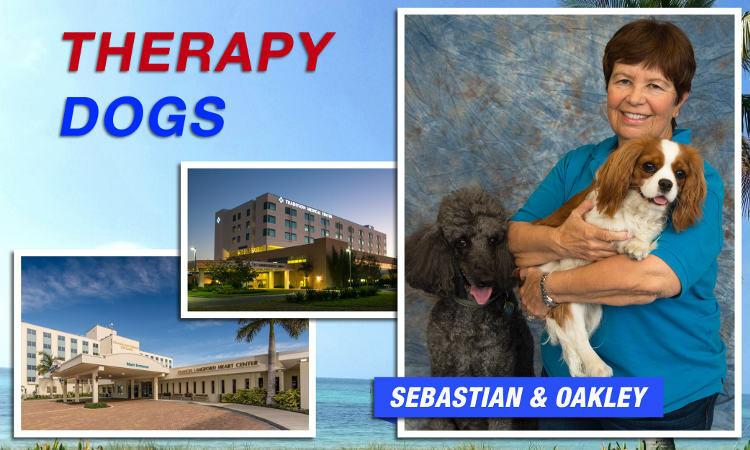 Sebastian is a Standard Poodle and a longtime certified therapy dog who regularly visits Tradition Medical Center and Martin Memorial North providing services to patients. Oakley, a Cavalier King Charles Spaniel, is in training to become a therapy dog and she is expected to receive her certification after she turns one year old in July. Therapy dogs provide many benefits that greatly improve lives and recovery time to those in hospitals, schools, nursing homes and special needs centers. They receive hours of training and must pass several tests to become certified. Therapy dogs instantly bring smiles and a sense of calmness and joy when they enter a room. Karen and Sebastian enjoy visiting these facilities and providing love and affection to those in need, and Oakley, who loves people, looks forward to joining them soon!